Philadelphia is the largest city in Pennsylvania and ranks sixth in population among cities in the United States. In 2007, the population of the city proper was estimated to be nearly 1.5 million, while the Greater Philadelphia metropolitan area was the fifth-largest in the United States. A commercial, educational, and cultural center, the city was once the second-largest in the British Empire (after London) and the social and geographical center of the original 13 American colonies. The city's founder William Penn named it Philadelphia, which is Greek for brotherly love. As a Quaker, Penn had experienced religious persecution and wanted his colony to be a place where anyone could fully experience freedom of religion. To this day, a popular nickname for Philadelphia is the City of Brotherly Love, though it is often informally referred to as Philly. During the eighteenth century, Philadelphia eclipsed New York City in political and social importance. It was in this city that some of the ideas, and subsequent actions, gave birth to the American Revolution and Declaration of Independence and the United States Constitution. It was once the most populous city of the young United States and served as the nation's first capital. 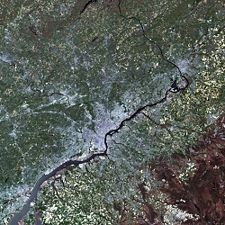 According to the United States Census Bureau, the city has a total area of 142.6 square miles (369.3 km²). Bodies of water in and around Philadelphia include the Delaware River and Schuylkill River, and the Cobbs, Wissahickon, and Pennypack Creeks. The lowest point is at sea level, while the highest point is in Chestnut Hill, rising approximately 445 feet (136 m) above sea level. 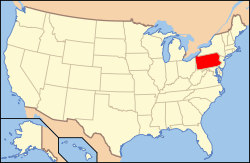 Philadelphia is located on the fall line separating the Atlantic Coastal Plain from the Piedmont. Philadelphia lies at the northern periphery of the temperate climate zone. Summers are typically hot and muggy, fall and spring are generally mild, and winter is cold. Snowfall is variable, with some winters bringing moderate snow and others snowstorms. Annual snowfall averages 21 inches (533 mm) Precipitation is generally spread throughout the year, with eight to 11 wet days per month, at an average annual rate of 42 inches (1,067 mm). Philadelphia has many neighborhoods, each with its own identity. The large Philadelphia sections, North, Northeast, Northwest, West, South, and Southwest Philadelphia surround Center City, which falls within the original city limits prior to consolidation in 1854. Numerous smaller neighborhoods within the areas coincide with the boroughs, townships, and other communities that made up Philadelphia County before their absorption by the city. Other neighborhoods formed based on ethnicity, religion, culture, and commercial reasons. Philadelphia's architectural history dates back to Colonial times and includes a wide range of styles. The earliest structures were constructed with logs, but brick structures were common by 1700. During the eighteenth century, the cityscape was dominated by Georgian architecture, including Independence Hall. In the first decades of the nineteenth century, Federal architecture and Greek Revival architecture were popular. In the second half of the nineteenth century, Victorian architecture was common. Numerous glass and granite skyscrapers were built from the late 1980s onwards. 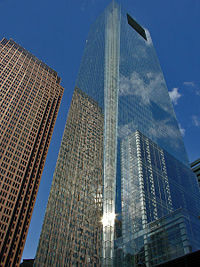 In 2007, the Comcast Center became the city's tallest building. For much of Philadelphia's history, the typical home has been the row house. For a time, row houses built elsewhere in the United States were known as "Philadelphia rows." 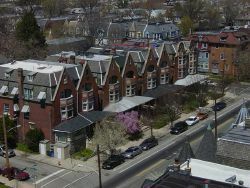 There is a variety of row houses throughout the city, from Victorian-style homes in North Philadelphia to twin row houses in West Philadelphia. While newer homes are scattered throughout the city, much of Philadelphia's housing is from the early twentieth century or older. The age of the city's homes has created numerous problems, which has led to blight and vacant lots in many parts of the city. Other neighborhoods, such as Society Hill, which has the largest concentration of eighteenth-century architecture in the United States, have been rehabilitated and gentrified. The Philadelphia area was the location of the Lenape (Delaware) Indian village Shackamaxon. Europeans arrived in the Delaware Valley in the early 1600s, with the first settlements founded by the Dutch, British, and Swedish. The Swedes sought to expand their influence by creating an agricultural (tobacco) and fur-trading colony to bypass French and British merchants. The New Sweden Company included Swedish, Dutch, and German stockholders. The first Swedish expedition to North America embarked from the port of Gothenburg in late 1637. Part of this colony, called New Sweden or Nya Sverige, eventually included land on the west side of the Delaware River from just below the Schuylkill River: in other words, today's Philadelphia, southeast Pennsylvania, Delaware, and Maryland. In 1644, New Sweden supported the Susquehannocks in their victory in a war against the English province of Maryland. A series of events led the Dutch—led by governor Peter Stuyvesant—to move an army to the Delaware River in 1655. Though New Netherland now nominally controlled the colony, the Swedish and Finnish settlers continued to enjoy a degree of local autonomy, having their own militia, religion, court, and lands. This status lasted officially until the English conquest of the New Netherland colony in 1663-1664 and continued unofficially until the area was included in William Penn's charter for Pennsylvania. In 1681, as part of a repayment of a debt, Charles II of England granted Penn a charter for what would become the Pennsylvania colony. Part of Penn's plan was to create a city on the Delaware River to serve as a port and place for government. 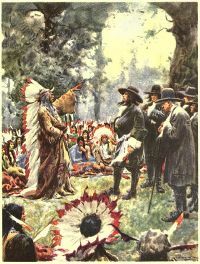 Despite already having been given the land, Penn bought the land from the local Lenape to be on good terms with the Native Americans and ensure peace for his colony. As a Quaker, Penn had experienced religious persecution and wanted his colony to be a place where anyone could worship freely despite their religion. Penn named the city Philadelphia, which is Greek for brotherly love (philos, "love" or "friendship," and adelphos, "brother"). Penn's plan was that Philadelphia would be like an English rural town instead of a city. The city's roads were designed with a grid plan, with the idea that houses and businesses would be spread out and surrounded by gardens and orchards. Instead, the inhabitants crowded by the Delaware River and subdivided and resold their lots. Before Penn left Philadelphia for the last time, he issued the Charter of 1701 establishing Philadelphia as a city. The city soon established itself as an important trading center. 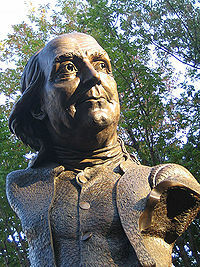 A significant contributor to Philadelphia at the time was Benjamin Franklin, who helped improve city services and founded new ones, such as the American colonies' first hospital. Due to Philadelphia's central location, during the American Revolution the city was used as the location for the First Continental Congress before the war, the Second Continental Congress, which signed the United States Declaration of Independence, during the war, and the Constitutional Convention after the war. A number of battles during the war were fought in Philadelphia and its environs. The city served as the United States capital in the 1790s. The state government left Philadelphia in 1799 and the federal government left soon after, in 1800. Philadelphia was still the largest city in the United States and a financial and cultural center. New York City soon surpassed Philadelphia in population, but construction of roads, canals, and railroads helped turn Philadelphia into the United States' first major industrial city. Throughout the nineteenth century, Philadelphia was home to a variety of industries and businesses, the largest being textiles. Major corporations included the Baldwin Locomotive Works, William Cramp and Sons Ship and Engine Building Company, and the Pennsylvania Railroad. Industry, along with the United States Centennial, was celebrated in 1876 with the Centennial Exposition, the first official World's Fair in the United States. Immigrants, mostly German and Irish, settled in Philadelphia and the surrounding districts. The rise in population of the surrounding districts helped lead to the Act of Consolidation of 1854 which extended the city of Philadelphia to include all of Philadelphia County. In the latter half of the century immigrants from Russia, Eastern Europe, and Italy and African Americans from the southern U.S. settled in the city. By the twentieth century, Philadelphians were seemingly content with the city's lack of change or excitement, and single-party politics, centered on the city's entrenched Republican political machine, allowed corruption to flourish in all parts of city government. The first reform came in 1917, when outrage over the murder of a police officer during that year's election led to the shrinking of the Philadelphia City Council. In the 1920s the public flouting of Prohibition laws, mob violence, and police involvement in illegal activities led to the appointment of a brigadier general of the United States Marine Corps as director of public safety, but political pressure prevented any long-term success in fighting crime and corruption. After struggling through the Great Depression, World War II created jobs and brought the city out of the Depression. However, after the war there was a severe housing shortage. About half the city's housing had been built in the nineteenth century, and many lacked proper facilities. Adding to housing problems was white flight, as African Americans and Puerto Ricans moved into new neighborhoods, resulting in racial tension. After a population peak of over two million residents in 1950 the city's population declined while that of the neighboring suburban counties grew. After a five-year investigation into corruption in city government, a new city charter was drafted in 1950 that strengthened the position of the mayor and weakened the city council. The first Democratic mayor since the early nineteenth century was elected in 1951. After two early reform mayors, a Democratic political organization had established itself, replacing the Republican one. Protests, riots, and racial tensions were common in the 1960s and 1970s. Gang violence plagued the city, most of it drug-related . In the mid 1980s, crack houses invaded the city's slums. Confrontations between police and the radical group MOVE culminated when the police dropped a satchel bomb on their headquarters, starting a fire that killed eleven MOVE members and destroyed 62 neighboring houses. 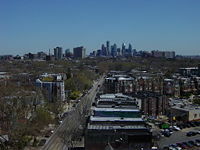 Revitalization and gentrification of neighborhoods began in the 1960s and continued with much of the development in the Center City and University City areas of the city. 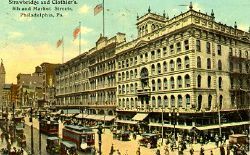 After many of the old manufacturers and businesses had left Philadelphia or shut down, the city started attracting service businesses and to aggressively market itself as a tourist destination. Glass and granite skyscrapers were built in Center City. Historic areas such as Independence National Historical Park are now among the most desirable living areas of Center City. This has slowed the city's 40-year population decline after losing nearly a quarter of its population. City Hall decorated for the holidays. The city is the seat of its own county. All county functions were assumed by the city in 1952, which has been coterminous with the county since 1854. The city uses the "strong-mayor" version of the mayor-council form of government, which is headed by one mayor, in whom executive authority is vested. The mayor is limited to two consecutive four-year terms under the city's home rule charter, but can run for the position again after an intervening term. The Democratic Party tends to dominate local politics so thoroughly that the Democratic primary for mayor is often more noticeable than the general mayoral election. The legislative branch, the Philadelphia City Council, consists of ten council members representing individual districts and seven members elected at large. From the Civil War until the mid-twentieth century, Philadelphia was a bastion of the Republican Party, which arose from the staunch pro-Northern views of Philadelphia residents during and after the war. After the Great Depression, Democratic registrations increased, but the city was not carried by Democrat Franklin D. Roosevelt in his landslide victory of 1932 (in which Pennsylvania was one of the few states won by Republican Herbert Hoover). While other Northern industrial cities were electing Democratic mayors in the 1930s and 1940s, Philadelphia did not follow suit until 1951. The city is now one of the most Democratic in the country, despite the frequent election of Republicans to statewide offices. Philadelphia once comprised six congressional districts. As a result of the city's declining population, it now has four. In 2015, according to annual homicide statistics and crime maps provided on the Philadelphia Police Department's website, there were 280 murders in the city. The same departmental site documents that the number of homicides fell slightly the following year, with 277 murders in Philadelphia in 2016, rising to 317 in 2017. Comcast Center, Philadelphia's newest office building. Philadelphia's economy is relatively diversified, with meaningful portions of its total output derived from manufacturing, oil refining, food processing, health care and biotechnology, tourism and financial services. According to the Bureau of Economic Analysis, the Philadelphia area had a total gross domestic product of $431 billion in 2016, the eighth-largest metropolitan economy in the United States. The city is home to the Philadelphia Stock Exchange and several Fortune 500 companies, including cable television and Internet provider Comcast, insurance companies CIGNA and Lincoln Financial Group, energy company Sunoco, food services company Aramark, Crown Holdings Incorporated, chemical makers Rohm and Haas Company and FMC Corporation, pharmaceutical companies Wyeth and GlaxoSmithKline, Boeing helicopters division, and automotive parts retailer Pep Boys. Early in the twentieth century, it was also home to the pioneering brass era automobile company Biddle. The federal government has several facilities in Philadelphia as well. 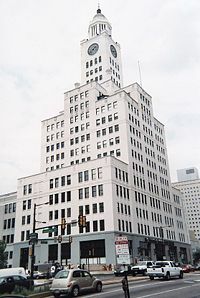 The East Coast operations of the United States Mint are based near the historic district, and the Federal Reserve Bank's Philadelphia division is based there as well. Philadelphia is an important center for medicine, a distinction that it has held since the colonial period. The city is home to the first hospital in the British North American colonies, Pennsylvania Hospital, and the first medical school in what is now the United States, at the University of Pennsylvania. The university, the city's largest private employer, also runs a large teaching hospital and extensive medical system. There are also major hospitals affiliated with Temple University School of Medicine, Drexel University College of Medicine, Thomas Jefferson University, and Philadelphia College of Osteopathic Medicine. Philadelphia also has three distinguished children's hospitals: Children's Hospital of Philadelphia, (the nation's first pediatric hospital located adjacent to the Hospital of the University of Pennsylvania), St. Christopher's Hospital, and the Shriners' Hospital. Together, health care is the largest sector of employment in the city. In part because of Philadelphia's long-running importance as a center for medical research, the region is a major center for the pharmaceutical industry. GlaxoSmithKline, AstraZeneca, Wyeth, Merck, GE Healthcare, Johnson and Johnson and Siemens Medical Solutions are just some of the large pharmaceutical companies with operations in the region. The city is also home to the nation's first school of pharmacy, the Philadelphia College of Pharmacy, now called the University of the Sciences in Philadelphia. Philadelphia's two major newspapers are the Philadelphia Inquirer and the Philadelphia Daily News, both of which are owned by Philadelphia Media Holdings LLC. The Inquirer, founded in 1829, is the third-oldest surviving daily newspaper in the United States. The first experimental radio license was issued in Philadelphia in August 1912 to St. Joseph's College. The first commercial radio stations appeared in 1922. During the 1930s, the experimental station W3XE, which was owned by Philco Corp, became the first television station in Philadelphia. The station became NBC's first affiliate in 1939. Philadelphia is served by the Southeastern Pennsylvania Transportation Authority (SEPTA), which operates buses, trains, rapid transit, trolleys, and trackless trolleys throughout Philadelphia, the four Pennsylvania suburban counties of Bucks, Chester, Delaware, and Montgomery, in addition to service to Mercer County, New Jersey and New Castle County, Delaware. The city's subway, opened in 1907, is the third-oldest in America. Philadelphia's 30th Street Station is a major railroad station on Amtrak's Northeast Corridor, which offers access to Amtrak, SEPTA, and New Jersey Transit lines. 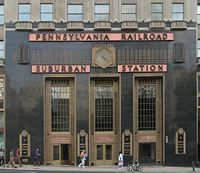 Since the early days of rail transport in the United States, Philadelphia has served as hub for several major rail companies, particularly the Pennsylvania Railroad and the Reading Railroad. Philadelphia, once home to more than 4,000 trolleys on 65 lines, is one of the few North American cities to maintain streetcar lines. Today, SEPTA operates five "subway-surface" trolleys that run on street-level tracks in West Philadelphia and subway tunnels in Center City. Two airports serve Philadelphia: the Philadelphia International Airport (PHL), straddling the southern boundary of the city, and the Northeast Philadelphia Airport (PNE), a general aviation reliever airport in Northeast Philadelphia. As of March 2006, Philadelphia International Airport was the tenth largest airport measured by "traffic movements" (takeoffs and landings), and was also a primary hub for US Airways. Philadelphia is a major hub for Greyhound Lines, which operates 24-hour service to points east of the Mississippi River. In 2006, the Philadelphia Greyhound Terminal was the second busiest Greyhound terminal in the United States, after the Port Authority Bus Terminal in New York. According to the 2016 United States Census Bureau estimate, there were 1,567,872 people residing in Philadelphia, representing a 2.7 percent increase from the 2010 census. Philadelphia has the second largest Irish, Italian, and Jamaican populations and the fourth largest African American population in the nation. Philadelphia also has the fourth largest population of Polish residents. In recent years, the Hispanic and Asian American populations have significantly increased. Hispanics have settled throughout the city. Philadelphia is home to the third largest Puerto Rican population in the United States. Many Mexican immigrants have settled in areas around the Italian Market. There are an estimated 10,000 Mexicans living in South Philadelphia. Mexicans and Guatemalans also have settled in small communities in North Philadelphia. Colombian immigrants have come to the Olney neighborhood. The Asian population was once concentrated in the city's thriving Chinatown, but now Korean Americans have come to Olney, and Vietnamese have forged bazaars next to the Italian Market in South Philadelphia. Concentrations of Cambodian-American neighborhoods can be found in North and South Philadelphia. Indians and Arabs have come to Northeast Philadelphia, joining Russian and Ukrainian immigrants. This large influx of Asians has given Philadelphia one of the largest populations of Vietnamese, Cambodians, Chinese, and Koreans in United States. The Philadelphia region also has the fourth largest population of Indian Americans. The West Indian population is concentrated in Cedar Park. Germans, Greeks, Chinese, Japanese, English, Pakistanis, Iranians, and also immigrants from the former Yugoslavia along with other ethnic groups can be found throughout the city. 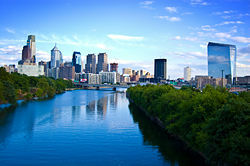 Philadelphia is one of the largest college towns in the United States and has the second-largest student concentration on the East Coast, with over 120,000 college and university students enrolled within the city and nearly 300,000 in the metropolitan area. There are over 80 colleges, universities, trade, and specialty schools in the Philadelphia region. The city contains three major research universities: the University of Pennsylvania, Drexel University, and Temple University. 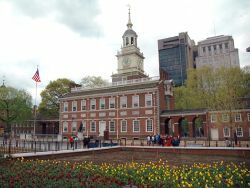 Philadelphia contains many national historical sites that relate to the founding of the United States. Independence National Historical Park is the center of these historical landmarks. Independence Hall, where the Declaration of Independence was signed, and the Liberty Bell are the city's most famous attractions. Other historic sites include homes for Edgar Allan Poe, Betsy Ross, and Thaddeus Kosciuszko. Philadelphia's major science museums include the Franklin Institute, the Academy of Natural Sciences, and the University of Pennsylvania Museum of Archaeology and Anthropology. History museums include the National Constitution Center, the National Museum of American Jewish History, the African American Museum, and the Historical Society of Pennsylvania. Philadelphia is home to the United States' first zoo and hospital. The city contains many art museums such as the Pennsylvania Academy of the Fine Arts, the Barnes Foundation, and the Rodin Museum, the largest collection of work by Auguste Rodin outside France. 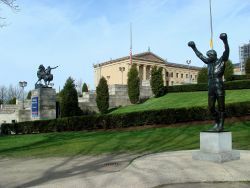 The Philadelphia Museum of Art is one of the largest art museums in the United States. The city is also home to a profusion of art galleries. Areas such as South Street and Old City have a vibrant night life. The Avenue of the Arts in Center City contains many restaurants and theaters, such as the Kimmel Center for the Performing Arts, which is home to the Philadelphia Orchestra, and the Academy of Music, the nation's oldest continually operating venue, home to the Opera Company of Philadelphia. Philadelphia has more public art than any other American city. In 1872, the Fairmount Park Art Association was created, the first private association in the United States dedicated to integrating public art and urban planning. In 1959, lobbying by the Artists Equity Association helped create the Percent for Art ordinance, the first for a United States city. 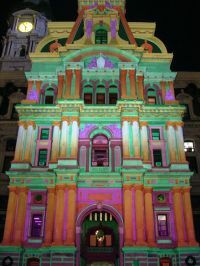 The program, which has funded more than 200 pieces of public art, is administered by the Philadelphia Office of Arts and Culture, the city's art agency. Philadelphia has more murals than any other United States city, thanks in part to the 1984 creation of the Department of Recreation's Mural Arts Program, which seeks to beautify neighborhoods and provide an outlet for graffiti artists. The program has funded more than 2,700 murals by professional, staff, and volunteer artists. Philadelphia has had a prominent role in music. In the 1970s, Philadelphia soul influenced the music of that and later eras. Philadelphia has a long history of professional sports teams, and is one of thirteen United States cities to have all four major sports: the Philadelphia Eagles of the National Football League, the Philadelphia Flyers of the National Hockey League, the Philadelphia Phillies in the National League of Major League Baseball, and the Philadelphia 76ers in the National Basketball Association. Philadelphia is also known for the Philadelphia Big 5, a group of five Division I college basketball programs: Saint Joseph's University, University of Pennsylvania, La Salle University, Temple University, and Villanova University. The sixth NCAA Division I school in Philadelphia is Drexel University. At least one of the teams is competitive nearly every year and at least one team has made the NCAA tournament for the past four decades. In February 2018, the Philadelphia Eagles won the NFL 2017 season Super Bowl. ↑ Estimates of Resident Population Change and Rankings: July 1, 2014 to July 1, 2015 – United States – Metropolitan Statistical Area; and for Puerto Rico. U.S. Census Bureau. Retrieved February 5, 2018. ↑ Estimates of Resident Population Change and Rankings: July 1, 2014 to July 1, 2015 – United States – Combined Statistical Area; and for Puerto Rico. U.S. Census Bureau. Retrieved February 5, 2018. ↑ Annual Estimates of the Resident Population for Incorporated Places of 50,000 or More, Ranked by July 1, 2015 Population. United States Census Bureau. Retrieved February 5, 2018. ↑ AreaConnect. Philadelphia PA Crime Statistics (2006 Crime Data) Retrieved February 5, 2018. ↑ CQ Press. 2008 Crime Rankings Retrieved February 5, 2018. ↑ Crime Maps & Stats Philadelphia Police Department. Retrieved February 5, 2018. ↑ U.S. Bureau of Economic Analysis, Gross Domestic Product by Metropolitan Area, 2016, September 2017. Retrieved February 6, 2018. This page was last modified on 19 March 2019, at 08:47.